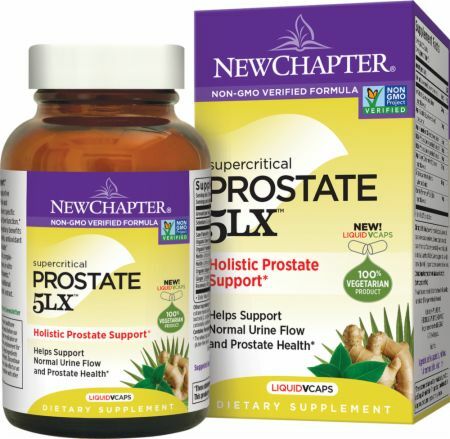 Prostate 5LX by New Chapter at Bodybuilding.com - Lowest Price on Prostate 5LX! New Chapter uses no harsh chemical solvents to deliver a super-pure, super-powerful herbal extract. No Prostate 5LX Reviews Found. Extra-Virgin Olive Oil, Hypromellose (capsule), Maltodextrin, Organic Yellow Beeswax, Candellia Wax, Culture Media (Organic Gum Acacia, Organic Soy Flour, Organic Saccharomyces cerevisiae [active and inactive], Lactic Acid Bacteria [L. acidophilus, B. bifidum, L. rhamnosus], Papain [deactivated], and Bromelain [deactivated]), Magnesium Carbonate, Organic Sunflower Oil, and Silicon Dioxide. Directions For Prostate 5LX: Two capsules daily with food. Not recommended for use in children. Warnings: As with any dietary supplement, you should advise your healthcare professional of the use of this product. Ask a healthcare professional before use if you have a long term medical condition, are taking any regular medication or have any surgery planned. Supplements should not be used as a replacement for standard medical therapy and may interact with medications. Read ingredients carefully and avoid use if known sensitivity to any of the ingredients. Discontinue use and contact your healthcare professional if you experience a side effect or an allergic reaction. Do not exceed recommended dose. Do not combine with other saw palmetto products. Keep out of reach of children.